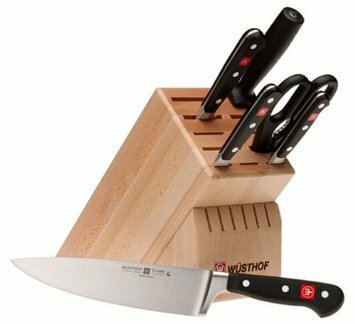 The Wusthof Classic 7-Piece set is a very popular product, ideally suited to those that take their cooking slightly more seriously and want tools they can rely on. 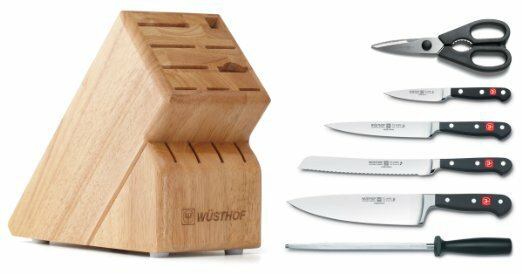 The Wusthof Classic 7-Piece – What’s Included? The extra slots in the block are ideal as clearly a discerning chef will need more than just 7 knives. The Classic 5″ Santoku knife and the 6″ Classic Chefs knife are recommended purchases as your collection grows. A fantastic, high quality knife set with a large block so that you can expand your collection should you want to. Like all knives from the Wusthof’s Classic line, superior German & Western styling has been adopted. The bottom line being these really are beautiful knives to look at and hold. They are also very sharp. If purchasing these will be the first time you have ventured into the arena of higher priced, quality knives… you will not be disappointed.